Pear O’Legs Records is back at The Gresham Centre in the beautiful Grade I listed church St Anne & St Agnes by St Paul’s with more fantastic music. Described by Folk Radio UK as “High-energy brilliance”, James Gavin, Dominic Henderson and Tommie Black- Roff are three of London’s finest new breed of folk musician. 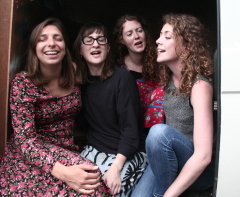 The Norfolk Broads are a four-piece female ensemble who enjoy singing low-pitched folk songs about love, despair, and dastardly boyfriends. They bonded over maritime work songs and failed romances in the alto section of a sea shanty choir, deciding to form a girl-group during a long car ride to Cornwall in 2015. Since then, they have performed their spirited harmonies at festivals and venues in London and further afield, including Wilton’s Music Hall, the Southbank Centre, Fire in the Mountain festival, Folk East Festival and on board the Cutty Sark. The Broads supply their repertoire of traditional stories with a very contemporary verve and energy, using old songs to fuel new takes on the lives of women both past and present. 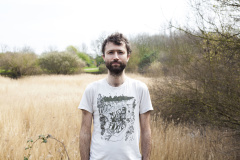 Josh Geffin is a singer, songwriter and guitarist from Dorset now based in London. Known for his inventive fingerpicking guitar style and poetic lyrics, he has been performing on the London folk scene since the mid-2000s. He has released three records including an EP of traditional folk songs entitled Rocks Of Bawn and his latest album, the instrumental work Hum and Glow.